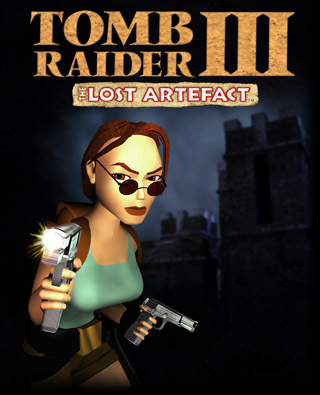 From the lofty towers of the late Dr. Willard's Scottish castle to the eerie catacombs of France, The Lost Artefact unveils the dramatic conclusion of events set in motion in Tomb Raider III. Upon the death of the dastardly Willard, Lara Croft learns of a lost artifact stowed beneath the Scottish mists at Willard's Loch Ness estate. Rumored to be the legendary Hand of Rathmore, this fifth artifact is the key to unlocking the final secret of the ancient meteor's powers. There is no time to lose, for whom else shares the secret and has joined the hunt? Five new levels: Speed dash, monkey swing, and quad bike your way through five action-packed levels. From Willard' Scottish castle to the desolate, sea-ravaged coast of France, Lara may be close to home, but will the pursuit of the lost artefact take her further away than she ever imagined? New enemies: Willard's guards are the least of your worries - keep your wits amidst savage warriors, flying prehistoric monsters and ghastly mutations. Special secrets: Unlock each level's special secrets - discover the Hidden Glen, the aging remnants of World War II, and even the truth about Nessie herself!